Twelve-spotted Lady Beetles or Pink-spotted Lady Beetles (Coleomegilla maculata) are found throughout much of North America, including here in southeastern Arizona. In November of 2006, I observed this late-season, coral-colored Twelve-spotted Lady Beetle crawling around on some leaves in the Empire Gulch in the Las Cienegas National Conservation Area north of Sonoita, Arizona. 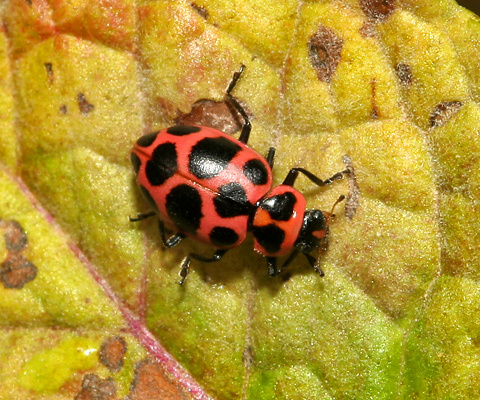 Twelve-spotted Lady Beetles range from pink to light red in color, and they have twelve black spots on their elytra (wing covers) and pronotum (the middle section behind the head). However, since two of these black spots span the elytra, when a Twelve-spotted Lady Beetle opens its wings, it appears to temporarily have fourteen spots (six on each wing cover). Despite their unusual pink coloration, Twelve-spotted Lady Beetles are actually ladybugs just like the more familiar bright red and black-spotted species and even have the typical rounded shape of a ladybug. The bright colors of Twelve-spotted Lady Beetles and other ladybugs are a form of aposematic coloration meant to warn potential predators that they taste foul and may even be somewhat toxic to very small animals. Birds and animals will generally avoid insects with black and bright orange, red, pink, or yellow markings. Twelve-spotted Lady Beetles are not only colorful and attractive, they are also, as are ladybugs in general, highly beneficial insects because both the adults and the alligator-like larvae feed on aphids and other small plant pests. In fact, Twelve-spotted Lady Beetles have such a voracious appetite for aphids that they are sold commercially as a form of natural aphid control. Although they do adore aphids, the adults will also eat flower pollen. Because I observed this Twelve-spotted Lady Beetle in a natural conservation area, I assume that it was a true wild variety and not a released biological control. Since it was autumn and the first frost was approaching, this Twelve-spotted Lady Beetle would likely soon be seeking out a snug over-wintering shelter with others of its own kind. Aphid populations can quickly explode in the springtime, and over-wintering predators like the Twelve-spotted Lady Beetle and other ladybugs are thus able to take immediate advantage of this springtime insect bounty.